LONDON -- Leicester City secured its first Premier League title without playing on Monday after second-place Tottenham drew 2-2 at Chelsea in one of the biggest-ever triumphs by an underdog in sports. Jubilant Leicester players watched the game at top-scorer Jamie Vardy's house and were filmed singing "Championes! Championes! Ole! Ole! Ole!" while jumping up and down with their arms on each other's shoulders. Just two years ago, Vardy and many of his teammates were playing in the second tier and then came close to being relegated again last year. They started this season as 5,000-1 outsiders for the title but for the first time in its 132-year history Leicester is champion of England. Leicester, which is based in a central England city with a population of 330,000, now has an insurmountable seven-point lead over Tottenham with two games remaining. The Foxes missed a chance to seal the title on Sunday when they were held to a draw by Manchester United but deposed champion Chelsea ensured the party wasn't delayed any longer. Tottenham had to win at Chelsea to keep its bid for a first title since 1961 alive and led 2-0 thanks to goals from striker Harry Kane and Son Heung-min, before Chelsea staged a second-half fight back to draw in a fiery London derby where tempers frayed and tackles flew in from everywhere. 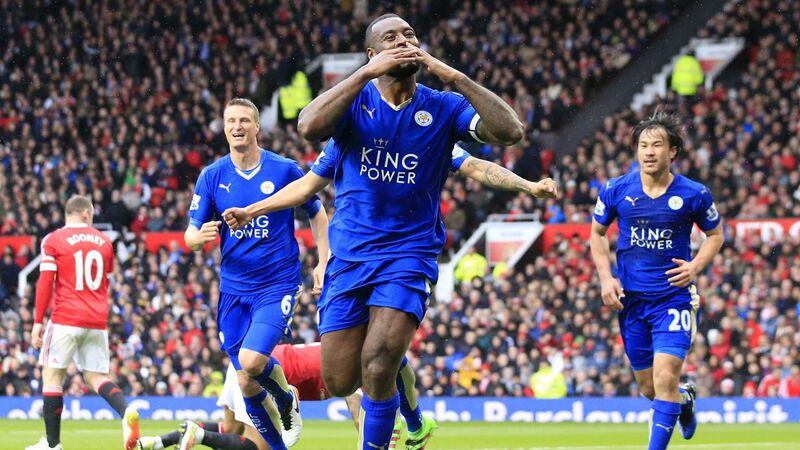 "What a game," Leicester defender Robert Huth tweeted. "Makes me look like an angel! CHAMPIONS!!!" Center half Gary Cahill pulled a goal back for Chelsea early in the second half, and with Tottenham clinging on, the equalizing goal was scored by Eden Hazard. Hazard's goal was almost a year to the day since his strike won the title for Chelsea, which is 29 points behind Leicester. Chelsea's collapse has been as astonishing as Leicester's surge to the top of the standings it was bottom of last April. Leicester will collect the trophy on Saturday when it hosts Everton at the King Power Stadium. English soccer has not had a first-time champion of the top flight since Nottingham Forest in 1978. And for the last 20 years the Premier League trophy has never left London or Manchester, with Arsenal, Chelsea, United and City sharing the trophy between them. Unlike that title-winning quartet or 1995 champion Blackburn, Leicester has achieved its success without lavish spending on its squad. Chelsea's draw also ensured Leicester manager Claudio Ranieri became a league title winner for the first time in his career, 12 years after the 64-year-old Italian was fired by the Blues. "Let's do it for Ranieri," read one Chelsea fan's banner at Stamford Bridge where the trophy was presented to Chelsea last May. British Prime Minister David Cameron wrote on Twitter: "Many congratulations to Leicester. An extraordinary, thoroughly deserved, Premier League title."